Sev khamani is a popular Surati farsan item that can be enjoyed as side dish with any meal or just the on its own as snack at anytime. As much the taste, the looks of dish attract me. 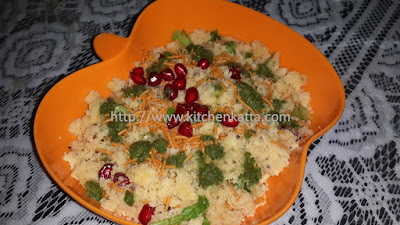 The version I am going to show here is made from leftover Dhokala, but you can make it from freshly ground chana daal also. That one I will post some time later. 1. Crumble Dokala and set aside. 2. In a pan heat oil, add rai, cumin seeds and as it crackles add green chilli. Add crumbled dhokala and reduce flame. 3. Add salt, sugar, chopped coriander and mix well. Saute for 1-2 min and transfer in a bowl. Khamani is almost ready. 4. 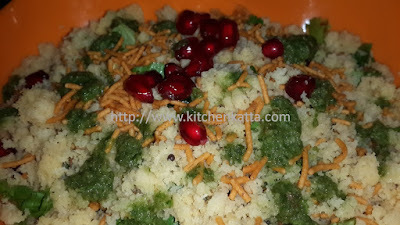 Spread sev/bhujia, pomegranate seeds on ready khamani. Garnish with green chutney. Sev khamani is ready to be served! !